2018 came to a close with this opportunity to share with those of Lutheran Haven on 12/23. You can watch and listen HERE if you so desire! I am constantly reflecting (and analyzing) and I can admit that the challenges of 2018 changed me. I realize that I am not the same person. Not everything felt good, was good, but I believe that it was necessary. 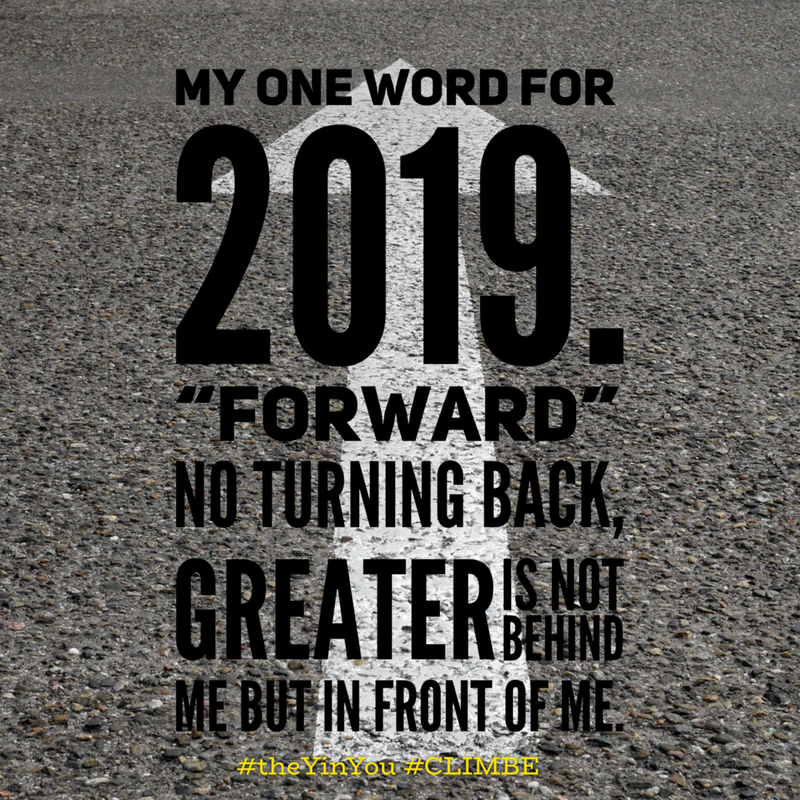 Now I, today, take a forward mindset into 2019. 2018 is now behind me or should I say serves as stepping stones. Reflecting on my previous post "Broken, but Built." The obstacles become opportunities, the sticky situations become stepping stones, the problems become possibilities. I am convinced that what we say and think of ourselves is our reality. Choosing my words and actions carefully, I will move forward, starting today. I am reminded of the many experiences I had as a child where I broke things around the house that were of value, not intentionally though. Some of those things were mine. Others belonged to my parents. Boy were they upset when they found out that I'd broken something of great value! I even remember classroom experiences where I'd broken things, only to feel great remorse. It was one thing to break something you owned but another thing altogether to break something that was owned by someone else and experience their wrath. As an adult, I see being broken very differently. Is it a bad thing to be broken? In Journey to the Y in You, it speaks about shifting perception, altering the viewpoint of our experiences that break us, those things in life that seemingly come to take from us rather than give. How can we intentionally look at something that looks bad, seems bad, feels bad and likely is bad and pull good out of it? I reflect often on myself an educator. How can I be better? How can I dig deeper? How can I be a greater influence on the lives of others and aid them in finding their 'why?' The truth about teaching, however, is that it isn't always easy. You are challenged to raise the bar for your students, coaching them towards success. That can be immensely challenging, yet rewarding. As a teacher, you aren't only influencing or impacting the lives of children but their families also, whether positively or negatively. Not every experience I have had in the world of education has been positive. To be completely transparent, I have been 'broken' during times of good intentions. I have been 'broken' when my there was disagreement with what should and should not happen in the classroom. I have been 'broken' through mistreatment and gossip. I have been 'broken' because of the color of my skin (as well as being male). What does it mean to be 'broken?' Being broken means that a part of you has been damaged or fractured. I LOVE Malcolm X's words here: "There is no better than adversity. Every defeat, every heartbreak, every loss, contains its own seed, its own lesson on how to improve your performance the next time." My most recent experience of being broken came at a time when I felt like so many things were going wrong. The truth is that if I'd never been broken, I would have never seen what I can now see. The truth is that if I'd never been broken, I'd never know what I now know. The real truth is that being broken provided the perfect opportunity to be built. When the foundation has been formed properly, structures can be built to withstand weather and other treacherous conditions. When a house has a proper structure, it can stand even in the middle of chaos and confusion. Along this journey of life, I have realized that not every experience will meet my expectations. It won't come neatly folded. It won't come in a box with a bow. It will come with challenges that are by design, necessary for improvement. It's all about how you view the obstacle. Viewing the obstacle as an opportunity is a great way to let being broken build you into a better and stronger version of you. What are my 100 Words? First thanks, Jessie Boyce for putting this little challenge out there. It's really a little HUGE challenge. I'd never thought about doing this before and here goes my disclaimer: This is probably one of the hardest things I’ve ever done, putting my joy of teaching and learning in 100 words. I love teaching because it is a perpetual process of learning & I am just as much of a student when I teach as the students themselves are. I love teaching because of the immense ability to “reach” and not just teach & to see lives transformed through that reach! I love teaching because little by little, the world can be changed for the better. I love teaching because of spontaneous discovery and the ability to empower students to C.L.I.M.B.E. There is nothing more beautiful than seeing students actualize themselves and take ownership and independence when learning. What are your 100 words? I think it’s time to get writing! I believe I read a quote at some point that said "If you try to make everyone happy then you'll never make anyone happy." As I constantly evaluate myself and place myself under the microscope, I am really that kind of educator that is all in. I am always thinking and doing something supports my professional role. It's like I live and breathe this educator thing. As if I was an educator before I was even born...and once I was, everything I did, good, bad or indifferent, led me to this point. I remember my first grade teacher who had supreme influence on me while I was a student in her class. I also went back to her classroom every day after school through fifth grade, to help her if she needed it. When I was off to middle school, I would still make it a point to head back to the school to help her in whatever way that I could. As a high school student, I began to track my volunteer hours since that was such a big thing and quite frankly I'd been involved a lot anyway. I went back to help her yet again, and upon graduation, was recognized as a member of my graduating class with a tremendous amount of community service hours. So this isn't the first time I've mentioned that little anecdote, but it is still a relevant piece regarding why I stand here in this position today. I grew up with high expectations, or in other words, those around me expected much from me. That said, as an educator, my expectations are also high, as it applies to those in my area of influence. I do my best to check my intentions to ensure they are always genuine. In other words, I try to ensure that my actions reflect an awareness of self and a focus on others. I have come to realize that even when actions are genuine, the actions don't always please everybody. As an educator, it's not so much about the quiz or the project or the school year as it is about life, character and responsibility. So my actions, beliefs and overall philosophy is driven by this premise. Perhaps it's a "bigger than me" mentality. It's not about me, but it is about the lives of the those within my reach. And thus, I am always focused on who those people are or who they will be, not the here and now. The truth is that not everybody will agree with you, believe in you, take the journey with you, or even support you. Whether that means family, friends, colleagues, administrators, parents or even students, trials come that they might make you strong. However there was a reason this "thing" all got started, and thus there is a reason why it should continue. Obstacles, opposition and trials truly are all a part of the journey and I have come to know that by design, they are tasked with making us better. I would never have known the strength I had to get through something had that something never challenged me or came my way. 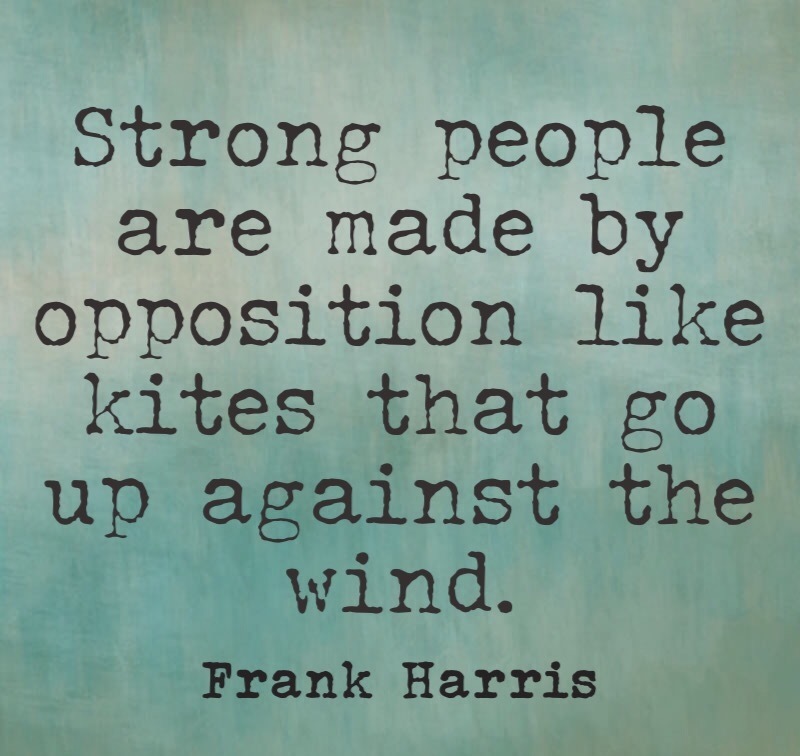 You realize who you really are in the face of opposition. 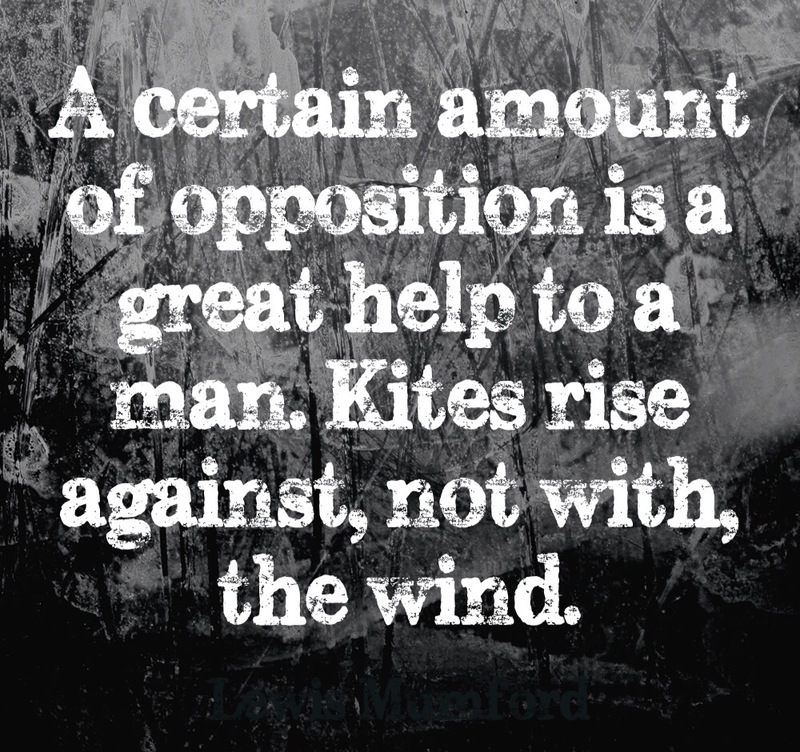 Opposition can of course come in many shapes and sizes. But I've learned to put the opposition under the microscope too. There are times I've asked myself "What's in it for me?" 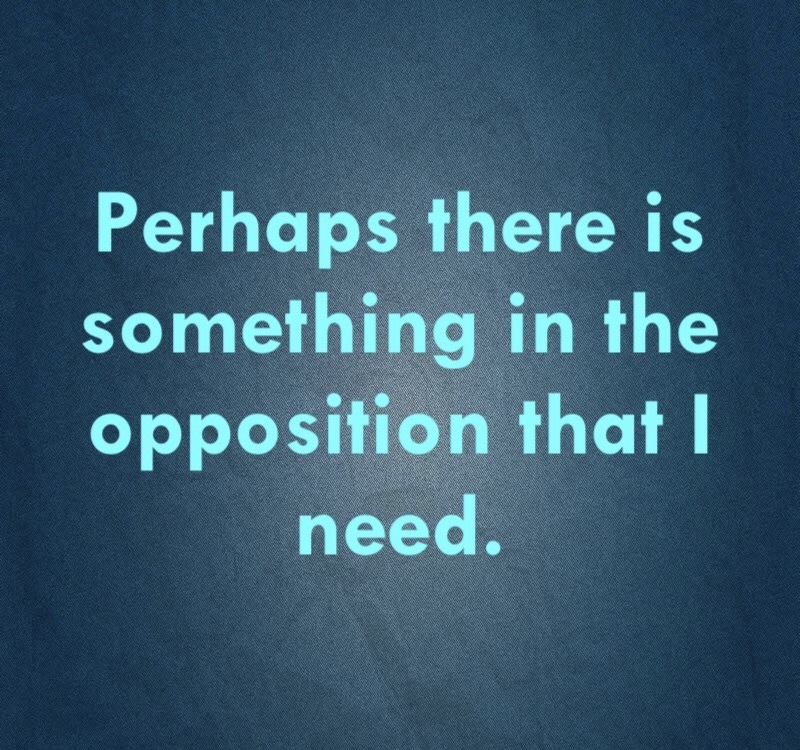 But the more I live, the more I realize that "Perhaps there is something I need in the opposition." 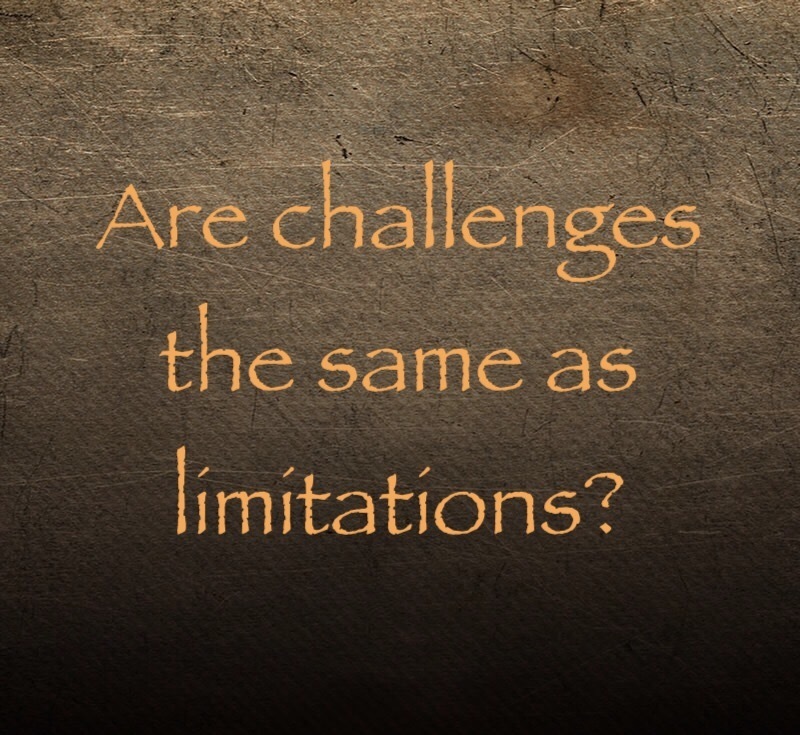 Challenges & Limitations: Are they the same thing? Are challenges limitations? I was watching a nature documentary recently, titled "Africa's Deadliest," I couldn't help but notice the sheer number of animals with physical and perhaps geographical challenges that may serve to box the animal in or by which we are able to identify the animal as it's species. For example, the crocodile is regarded as a fierce predator, who has intense bite force and is able to take out animals that are equal or larger in size. The water is where the crocodile's greatest strength is realized because of its ability to ambush prey, often by surprise as they draw closer by holding their breath underwater. You might say that the water is the croc's livelihood. However, the crocodile's teeth are not designed to tear and chew it's prey once caught and suffocated. Instead the crocodiles must group together and rely on each other to tear prey and then swallow it whole. Not only that, crocodiles are sloppy & less balanced and effective while on land versus in the water. You might say that the challenges that the crocodile experiences are opportunities for them to capitalize on their strengths and/or cooperate with other crocodiles in order to accomplish the task at hand. Are these challenges experienced by crocodiles also their limitation? Well that depends on how you view it. Let's take another example. The cheetah is hugely regarded as the fastest land animal on Earth reaching speeds of 65 miles per hour or more. This is of course a feature that enables the cheetah to attain its prey when it travels at intense speeds. Unlike its counterparts and related species, it is able to traverse distances in order to reach what may otherwise be unreachable. A drawback however is the need for cheetahs to recuperate after traveling at such immense speed before it can devour what it's speed allowed it to reach and overtake. In fact, the documentary identifies that the cheetah becomes so overheated that it is close to going brain dead after working so intensely to feed itself. If this wasn’t enough, the cheetah then has to deal with the lions and hyenas, opportunists, that pose a serious threat to the cheetah itself, not to mention its prey being stolen. Is the cheetah’s speed a challenge or a limitation? A third example is the Monarch butterfly, a delicate creature, faces more than one challenge in its lifetime. Of its challenges are habitat loss, pesticides and herbicides, and climate change. Starting out as a caterpillar, eating constantly, it has to undergo a complete physical change, only to have a limited lifespan once its metamorphosis has taken place. An average butterfly has an average life span of two weeks in which it must carry out its life obligations in order to ensure that generations behind it may carry on, survival in mind. And so now we attempt to bring it home, to the crux of the matter, the reality of the world we live in today. We all have challenges, animals and human beings alike. We all have things that we face on the daily that we have the opportunity to overcome. If we sat here and thought long enough, we would be able to identify challenges for each animal and even plant on the face of the earth. All living things face obstacles and challenges that “challenge” the existence and survival of the species. Could we ask the cactus plant to stop sucking up water so that it can survive during the harsh times of drought? Could we ask the kangaroo to stop digging holes into the ground in order to cool itself in times of extreme heat? Would it be appropriate to ask the alligators and crocodiles to remain in the water so they do not threaten our existence on the earth? The truth is that challenges can be viewed as obstacles, but are not necessarily limitations at all. They are opportunities to be creative, adapt and find ways to conquer what could have conquered you. We fill continue to face challenges but we do not have to allow those challenges to keep us from moving forward in the best way possible. So let’s think about education and the roles we have. Our students. Do they have challenges? You bet they do! We as the educators face challenges as well. Our students have various backgrounds, cultures, experiences, values, morals and beliefs that may not necessarily line up with the next person. Does that mean they are any less valuable? Of course not, but perhaps these challenges are opportunities to learn how to embrace and celebrate the various aspects of our world that make it unique and diverse. Where would we be without challenges? We’d never learn how amazing the world and those therein truly are without challenges. We’d never see the bravery if there was nothing to fear. We’d never know love, if rejection wasn’t a reality. We’d never see the stars if they didn’t shine in the middle of darkness. We’d never know the opportunity ahead without the challenges that propel us to pursue with patience that which lies before us! Turn your challenge into an opportunity, don’t let it limit you. Now the above quote is the type that really reaches out and grabs me. Consider for a moment that listening helps you to understand what is missing or rather what can be added to a conversation. Is anyone really listening to you when you speak? Do they even care enough to stop talking or doing, long enough to listen to what you have to say? That is the question of the day. When I listen to you, it means that I care about what you have to say and that I am allowing you the space, the time, the platform, or the opportunity to share it. Sounds easy right? 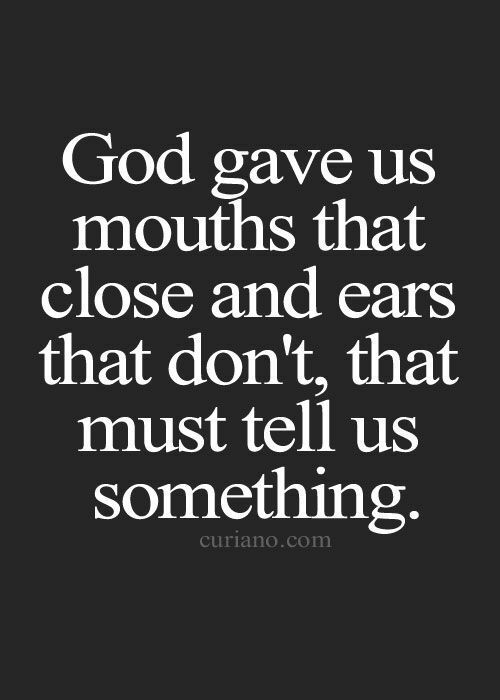 Is there truly anything to be gained from talking and never stopping to listen. I’d heard someone say that we have two ears and one mouth (Epictetus) The more I consider it, the more I realize that there is such value in being one who listens, or in fact, is slow to speak. I can attest to the fact that I have learned so much simply by listening to people, without ever having to utter a word. My dad had always been slow to speak. But when he did speak, his words commanded the attention of all those in his vicinity. You might say that was due to his profession, his family or his wisdom. I submit that it was due to his decision. I question today the value that is placed on positioning yourself so that you can hear from someone else, "truly." All too often, the experience as been the opposite, where we talk constantly, or even without regard for what someone else may have to offer. 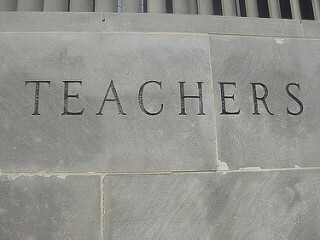 As an educator, one considers the students that he or she teaches; I definitely do. Naturally in a classroom where learning is to take place it requires both listening and speaking skills. Is one more valuable than the other. Perhaps not, however, they do have equal relevance in the day-to-day expectations of a teacher. This is of course not limited to students listening to a teacher, but students listening to other students. Listening is an important skill for all. Surely I cannot truly expect my students to listen if I don't model that, or walk it out in front of them. I'd rather be the example instead of a hypocrite. They all get excited about sharing. They are all engaged in the process of speaking, and will take every opportunity to talk to others. But what about the listening piece? How do you teach students about the inherent value of being a good listener? How might you model being a good listener for students such that he or she (the students) can understand that if they listen, they can earn greater understanding of an idea, but at the same time, consider a respectful and sound response to what they have heard? So together, listening and speaking form a conversation. And the conversation is one that has value because the participants are involved in both the listening and speaking components. What would change if we all made it a point to be better listeners? And by so doing, what we are able to add to the conversation is both impactful and relevant, furthering the learning, rather than taking from it. Does listening make you a pushover or "weak?" Not at all. I believe it truly means you understand and respect others when you can see value in their words. We all have experiences. We all have stories to tell. Dare I say that we can all benefit from someone who will listen? Dare I go further and say that listening will change not only the life of whom you're listening to, but your own as well? Someone listened to me. I've not been the same since. 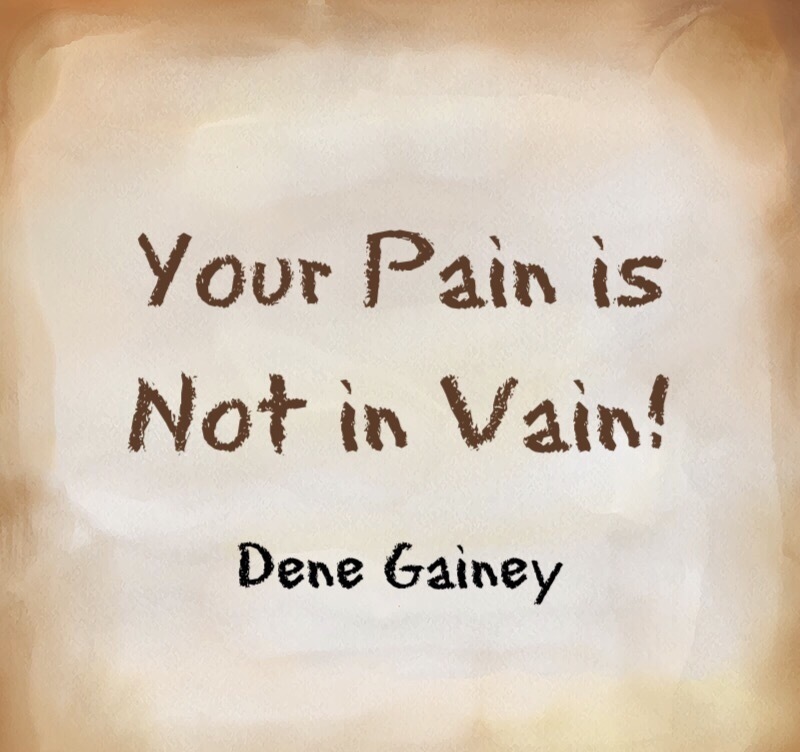 Your Pain is Not in Vain, that it what the intent of this post is to convey. Would you have ever thought that as a teacher or maybe just as a person who happens to be a teacher would ever experience pain? No way! Not in the education profession. If I were to poll the population in question I wonder what results would find. Now I'd say that this is not a topic that I enjoy talking about at all but I've had a revelation. Pain has a purpose. Pain is necessary for you to first identify that there is an issue somewhere whether physically, mentally or emotionally that needs attention. Second, pain is a reminder of the imperfect creature I am. It says hey Dene, here is a challenge for you that if you overcome it, has the unlimited potential to make you more than you were, or improved from yesterday to today. Pain just like people, comes in many different shapes and sizes. It doesn't favor anyone but has the ability to land on us all. So many times I've wanted pain to end, but as I continue to exist on this earth I acknowledge a different perspective of the pain. The pain helped me. The pain reminded me. The pain grounded me. The pain hurt me real "good." When my father passed away from this earth I didn't know what I was going to do with myself. In my mind, my dad (and mom who still lives) was the reason I strived and kept going and moving. I emulated them and cared so much about their approval and affirmation. My dad was my strength and when he left me; I felt like Samson (the Bible character) that my strength had been wrongfully taken from me. Nevertheless, my dad was ready to get the heck out of here after having raised seven of us to be productive contributors to the society in which we live. He said give when people take. He said smile in the face of adversity, and it will come! He stood strong when others decided to sit down. He rescued me in times I knew it was impossible. He was in essence the hero that with my mother are the reason I live and breathe air today. Thus, when he took off I felt like I didn't have that wind beneath my wings anymore. In retrospect, I wonder if that's why he took off, because the pain of his departure propelled me into the purpose that he often spoke of in conversations I'd had with him. He believed in me when I didn't know to believe in myself or what to believe. So imagine the pain and devastation of a strong father saying goodbye to this life? Well I had to understand and embrace the pain within this situation. Why? Because there was something to be gained from the pain. If my father was here today, he would say I don't know why you're crying, get up and do what is in you to do! Strength came in the pain of my father who was "half" of my strength, moved on to a better place. So I've fully embraced the conversations I recall having with him, so much so that I passionately pursue them in the knowledge that he knew me! He knew I could, and now I can see it for myself! That's not to say that I still don't have doubts but the pain reminds me that yes, I can, even when the odds say I can't! As an educated black male, the pain, the stigmas and the burden that I carry to bring change to eyes blinded by untruth, injustice prejudice and stereotypes that would suggest that I'm not good enough, or the realization that people look carefully when I walk into a room because they are unsure of who I am, or to allow me the opportunity to be who I am without first passing judgment on me. That's painful. It's a pain that shouldn't be but even in that, it's a pain that has benefits. You say I'm "this" but I am "that." To parents that have qualified me as illegitimate or unworthy of operating in the capacity in which I do, to those that are naysayers that have attacked the very place in which I sit and stand, that's painful. It's true. But at the same time, there is a thank you somewhere inside of me. I am more aware now and because of it, I go harder. I work harder. I strive harder, despite those that for whatever reason diminish your capacity with their thoughts, words and deeds. It's pain that I endure because I know that someone may look to me as an example of pure love, genuine care and concern and a peacemaker, just like my father. I don't wanna (yes I said wanna) be perfect. I want to work on continuing to make myself better. Perfection assumes that I've learned it all, seen it all, done it all, and that there is nothing more to strive for and achieve. I've learned to revel in my imperfection and despite the pain of the moment that may reveal weakness and may cause you to be embarrassed around others who may be better than you, or perpetuate themselves as such, it is an opportunity to identify where you may be weak and work toward making yourself (myself) better than I was the day before. I'll never stop trying to be more, do more, at every chance I get. I'm not what I've gone through. Tomorrow isn't promised so the pain, as hard as it may be to accept at times, is necessary for life and certainly not in vain. So if pain greets you at the front door, know that it has value and shift your perspective to the place where you can see that value and use it to be better than you were prior to the pain. "Different people, in good faith, can look at the same fact and interpret it differently. But that's where an interesting conversation begins." I find it very interesting how with all the technology that has made communication amongst people more efficient, it at the same time may be the go-to for communication as opposed to the traditional face-to-face gatherings that still have the power to spark electricity, identify common ground and insight movements in the forward direction. Such a conversation was had on Saturday, March 18, 2017 as a fellow educator and I traversed the lengthy alligator-filled pathways of the Lake Woodruff Wildlife Refuge in Deleon Springs, FL. While I did not think quickly enough to document the entire conversation, I was able to capture much of the meat that was both relevant and affirming. I will do my best to transcribe that here today. Male teachers in education are a rare breed and what power there is when male educators particularly in elementary education take the reins and are all in, in terms of impacting a generation. Listening to students is so important. We talked about blended learning and multi-modal learning. We all have different interests and if we approached teaching and learning from that angle, it carries over to the way in which our attention is grabbed in school. Can you give me a way to learn that interests me? I will be engaged if it interests me. Not, let's do this the same way because it's always worked. While that may be the way that is assumed because enough of the students are responding or due to it benefiting the school in terms of standardized assessment or school grade, what about the rest of the students? What about the students who fall through the cracks? In the long run, this may create students that attach no value or meaning to learning and ask "Is this what school and learning is all about?" these students may resort to other avenues due to where they were no provided opportunity to explore what interested them. This could lead to increased amounts of students dropping out or not finishing because they felt they had no reason to. "If this is how things are going to be done, then I am going to check out" may be the thought that runs through many students' heads. What would happen if we flipped that script? What if we started to actually pay attention to learning styles and student interests and tie that into the curriculum? In no way are we excusing curriculum needs and grade level expectations, however we should work to integrate them. I do believe it is possible to accomplish and in most cases exceed expectations if we tied in blended learning, multi-modal learning so that students are receiving knowledge in a variety of ways, not just sitting in a classroom listening to traditional lecturing all the time. They need to do, they need to get up, they need to move. Maybe with options and variety we empower students to be risk takers because there is variety, and that variety includes learning in ways that are not common to them, but learning nonetheless. It encourages them to be more risky in their learning. It is not a one shot, all or nothing kind of deal, which is unfortunately a lot of what ends up happening due to standardized assessments. We must be held accountable yes as educators and the easiest way to do that is through test scores. However, if they really want to see excitement and kids learning and taking risks, it has got to go beyond that (Kim Howell-Martin). Schools that are under-performing are potential for extensive growth. If we gave kids opportunities and tried new things, even beyond flexible seating, we would see great results. Imagine how interests can even be developed when students are able to see things in a different way than traditional learning? We need to break out of the mold. It gives new meaning to a PLN and lifelong learning. It is hard to get stuck in a place if you constantly learn. I need to continue to develop because I don't want to ever get to a point where I cannot reach the kids in my classroom. Making that bold declaration would imply by motivation alone that we WILL impact (REACH) the students in our classrooms because we desire to. It is a constant transforming mindset. It cannot become stuck in a certain way when you are constantly molding your skill-sets and mindsets. In most schools (and if students stay), many teachers will teach each of the students. It needs to become a corporate effort to reach them. If educators approach their REACH differently, imagine how the students' mind sets, motives and drive to come to school in the first place would change. Kudos to the idea of when you can engage students in a variety of different ways, imagine how much more they will be motivated to come to your classroom and be independent learners and go beyond what you may set as the precedent in the classroom. They will want to go beyond that because you have empowered them with the tools. (Check out Chapter 9 of the Edumatch Snapshot in Education 2016 Published book) What can we do to stretch the kids to decide on what they want to do and then help them to open doors to opportunity? "The only thing standing in the way of you and what you want to do is you." What if our kids understood and embraced that thought? What if education at large actually validated that statement by not standing in the way? Motivation is huge. Do they believe they can? They need to SEE what is out there. They need exposure to things in order to develop and learn about what they may want. The whole real world aspect of things is a great way to expose kids. Applying meaning to learning essentially is looking at the real world. What is truly out there? Let's think organization for just a moment, why do we need it? Let the kids answer that question. This is a real-world expectation. We are learning the tool of organization today, why? Why would organization be important in LIFE? Can you think of situations where organization would make the difference between success or failure? Can you recall any personal experiences about how organization was helpful to you or your family? My point here is that connections to the real world are important and students begin to see how meaning is attached to things being taught due to their LIFE-connection. It goes far beyond my classroom. The light bulbs then come on, the habit is created, and then students have purpose for what they are doing. I am challenging all of you that read this blog post to engage in conversations. You may never know the power inherent in something that is seemingly so simple if you don't start talking. Who knew that all of this would have come out of a simple walk in the wildlife refuge? Engage. Input. Listen. Learn. Spark. I can't wait to take this conversation piece further through student edcamps within the classroom where the students can also have conversations and they too can see the power! We've got the power! Ed Camps are simply the new thing (for me), or maybe just "the thing." Sure, there are still excellent conferences and forms of professional development, but Ed Camps I like to think of as by teachers for teachers, to the extent that learning something new is guaranteed. After all, You don't find many who are willing to give up 4-8 hours on a Saturday to learn, especially with no monetary compensation. Not only that, there is much to be said for those who travel some distance to get to the Ed Camp, not to mention all of the planning and behind-the-scenes work to make it run so seamlessly. Katrina Worthington facilitated this session and we discussed the many benefits of FieldTripZoom, Skype and Mystery Skype. Further, the idea of inviting authors to Skype or go a hangout with you and your students can be both a powerful integration into the classroom as well as an opportunity for you to break down the walls and bring learning to them, especially if you can't physically take students to the source. I have already seen a great topic variety to supplement what we are doing in the classroom. Magic Pants Jones (Sean Farnum) facilitated this session on podcasting, introducing the idea to educators as a way to empower students and give them the space to again, have a voice that can be shared beyond the four walls of the classroom. Sometimes the important messages are allowed to be delivered when educators give the students the opportunity to share that. Many ideas were bounced around the room, to include: One Word for 2017, inspirational podcasting, podcasting to state and local representatives, and conversation or interview-based podcasts. I did get the opportunity to briefly share my experience with students having worked with them to produce the second podcast of the year titled: "Black History Moments." I have conveniently linked it to my blog page for easy listening. There is a growing excitement surrounding getting students talking and creating in this way. Platforms like Garage Band, iPad Audio Apps and even Voxer can be used to grab the student recordings, and then audacity and/or garage band can be used for editing. Podomatic is a great way to publish the podcast, as well as Podbean and even Apple Itunes. I have always wanted to try this out. What an incredible thought/idea, to approach teaching and learning in a new way. What if we allowed students the opportunity to have a voice and learn in a different way? One of the huge takeaways from this session was the fact that students are losing sight of social skills and technology (though useful and appropriate for learning and life, often becomes the tool used for babysitting students when adults are preoccupied or busy with life themselves. The true call of technology is to supplement life, not take over it. A group of educators present in the conversation derived the hashtag #staugssedcamp so that we can get the party started, share ideas about implementation over time, successes and tweaks. Jennifer Casey, Julie Haden, Kristin Westberry and Katrina Worthington were among the spark igniters in this session. We are all looking forward to engaging students in this way. Katrina spoke about the structure of the camps, and how topics were selected by the students, from Starbucks to Minecraft and even favorite drink items. She further commented on the level of student engagement therein and the oral reflections with students after the sessions were over. Joe Robison shared some valuable input as well regarding his experience with student edcamps. At EdCamp Orange, Sean Farnum facilitated a session on the importance of play in classrooms for students, and Tammy Neil continued that conversation at EdCamp St Augustine. (#edcampstaug) There are many ways that students can play in the classroom, but Tammy Neil stated students need to "play with a point." That makes sense, as there should be some structure so that even though it is play, it is a learning experience. The term inquiry-based learning serves as a great umbrella for play in the classroom as it is research-based and by nature of the idea, there is no one "right way" to inquire. We all know the value of asking questions. And as I always say, without questions, we lack answers. From ideas like Go Noodle, maker spaces, spheros, and ozobots, to gamifying the classroom with Classcraft, students are learning while doing. There is no one way to play, but play is crucial. I can't wait for the next ed camp, and it looks like that will be on March 25th, which is EdCamp Putnam in Palatka. It's all about the teaching, learning, sharing and growing. I am grateful to be surrounded by people who believe in being lifelong learners. Now you might say what I have said many times, or asked myself...Is it really worth it? We think of our duty as educators to shape, mold and educate the young breed as a calling. I couldn't agree more about the nature of the role an educator plays. It's about something bigger than ourselves. It's a larger than life kind of niche, so much so that the educator plays a central role in the lives of students, dedicating his or her life to instilling in a child the tools and skills necessary to take on a world that continues to grow and change. That's a tall order. The truth is that the integral seat that educators sit in is not always easy to occupy. In fact, some may say that it is never easy to occupy. Teachers touch tomorrow. Teachers touch today. Teachers made tomorrows easier today. In the words of Dr. Dorian Roberts, we make it look easy. But it is certainly far from that! If the truth was to really be told, there are days where I wished I could have slept in on a Monday morning (and maybe not just Monday), whether the weekend was short or long, but the alarm went off (5:15 early), I got up and made my way to work. After my routine Starbucks run, I end up at work, first one there, dragging as I sip every ounce of my Venti hot caramel macchiato, extra shot. Like the flick of a light switch and once I get into the classroom, something happens! I am reminded of the job set before me, not the one I get paid for, but the one I am called to and happen to be compensated for in the process. The creative, enthusiastic facilitator of learning comes alive in me (not to say that it ever sleeps). The espresso just brings him back. Ha! The lesson plans, the committee meetings, the staff meetings, the parent conferences, the grading, the paperwork, the after school clubs, the tutoring, the school even nights, is it really worth it? How do you measure success? Is success the educator who stops learning? Is the successful educator the one who thinks that there is nothing more to learn or do? It is a lot to juggle all of these tasks associated with the the educational seat we sometimes so comfortably sit in. 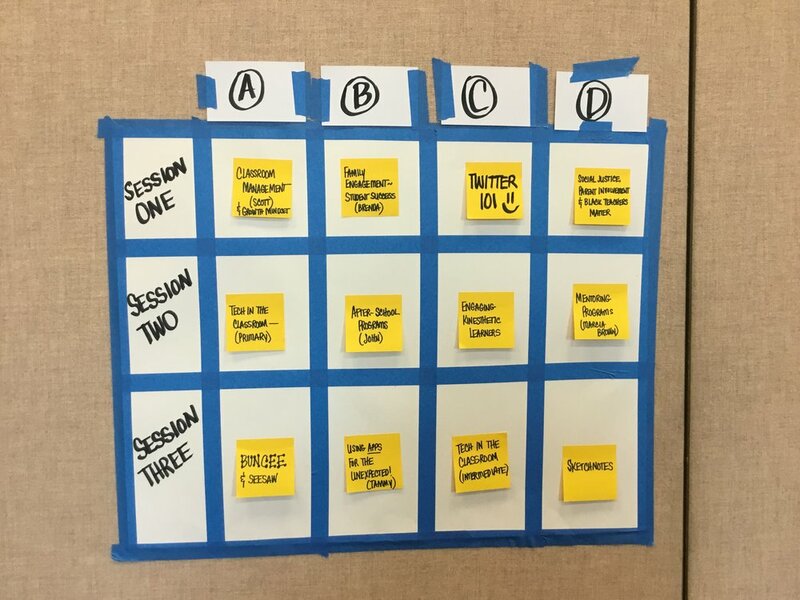 Is it worth going to that compelling conference, establishing that powerful PLN, or attending that engaging EdCamp? Well, when you consider the potential outcomes, I think the answer is clear. There is ALWAYS room for growth. Consider the student that is always eager to get to your class because there is always wonder involved in the learning process. Think about that kid that only you are able to reach. Don't forget about the student who may have some behavioral concerns, but respects you so much and listens to you. Maybe it's that student that you have become an advocate for. The student who only has one parent (or two) and you easily become the other, or the third. Consider the long-term impact of you taking the time to make a difference in the life of child, when you can develop REALationships with them! A REALationship is a teacher-to-student connection that is REAL, authentic, intentional and impactful. What you do on a daily basis will carry on beyond you. I will be the first to say IT IS NOT EASY to walk in the large shoes of an educator who never sits down, but constantly seeks to learn and grow so that the students can continue to learn and grow. I will say though that IT'S WORTH IT. I solemnly swear that I am up to no good! You may be very familiar with the title of this blog post, and if not it is a phrased borrowed from J.K. Rowling's Harry Potter and the Prisoner of Azkaban. I am definitely grateful for 2016 and all of the things that have transpired, the good, the bad and the ugly. I have to say that so many things happened this year, many of them for the first time. Suffice it say that sometimes it just takes that first step and then taking that step leads to additional steps and before you know it, you are immersed in the teaching and learning experience. That is exactly what happened to me and as you read through this, you will see what types of things it has led to. I am truly grateful to not be an annual learner, or a weekly learner, but a lifelong learner. I do not want to ever stop learning. I was honored by a few parents as they each submitted a nomination to the state of Florida on my behalf for an Outstanding educator award. Mind you I was not selected as the recipient, however it spoke to the work that I do daily in the classroom and the degree to which parents notice, not just in what they see you do, but how their child's lives are transformed as a result of your diligence, passion and eagerness to help. I was moved by the nominations and received copies of them all and will keep them. I'd heard so much conversation about blogging around this point in the year and had to respond. Of course the immediate question in my mind was where to find time to "fit" blogging in, and I also questioned its purpose. Now that is not to say that I have not ever written things down, but specifically, the writing I had done were poems, stories, songs and journaling that I tended to keep to myself. Long story short, I began to understand the value of a blog post as a means to share with others your experiences, findings, "aha" moments and "the stories" we write through our lives. So my blogging began to take shape when I realized that other people actually wanted to read what I'd written. They actually cared about the insights and anecdotes I'd picked up along the way, enough to take the time to read and in some cases, respond. The rest as they say is history because I have posted several times since then and although this is the first post after a bit of a break, I enjoy the blogging and now use it with my students in the classroom. Just as it helped them to establish community amongst each other in the classroom, through an electronic platform and interaction there, it has helped me to grow and connect with others and enrich myself through developing a PLN. I couldn't always officially say that I'm an author. But today, I can confidently state that I am, alongside so many "greats" in the education world. Through EduMatch we have pulled a phenomenal project together. So, if I had not started "small" with blogging, I may not have ever developed the confidence in what I had to say, to take part in a bigger writing adventure. Now, I am excited to pursue writing further. EdCamp Magic was my first EdCamp ever that I'd attended. Prior to 2016, I hadn't even heard of an EdCamp and was basically ignorant of what they were and what they had to offer. But through my voxer and Twitter participation and connections with these awesome individuals, some of which are pictured in these photos, I learned. I made my way to Windermere Prep for what I would say was the best "first" experience ever. I met several of the people face to face that I'd interacted with on Twitter for a while, including: Sarah Thomas (founder of EduMatch), Tammy Neil, William Jackson, Zac Leonard, Alex Stubenbort, Dan Koch, Fran Siracusa, Jennifer Williams, and Amber McCormick. I participated in my first Tweet and Talk, which brings together Twitter and Google Hangouts live on air. I was quite excited to join in and at the moment I do not recall what the topic was. However, Sarah Thomas hosts these weekly and moderators guide the discussions. Panelists sign up to take part in these tweet and talks and I am better because I got involved. 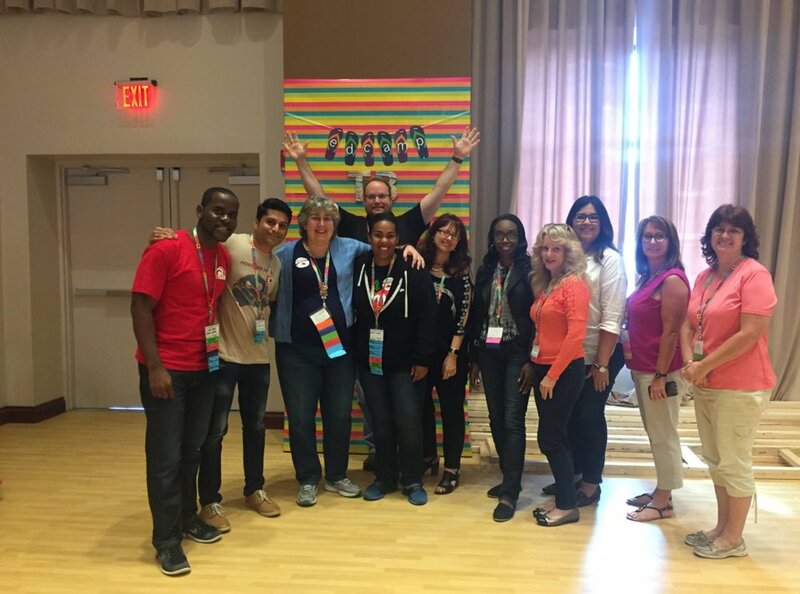 The picture below are some of the phenomenal individuals who attended the Superior Tech for Teachers conference at the Plato Academy in Clearwater, FL. It was two days filled with learning and exposure to technology. Shout Out to Clarence Tan who shared his math platform with educators at this conference. EdCamp Volusia is where I met Kimberly Michelle Martin for the first time face-to-face, but had interacted quite often via Twitter and Voxer. This picture was taken during an App Smash where various educators shared great apps or tools that other educators should use or could use as tools in the classroom. Edcamp Putnam was my first time taking the step to facilitate a session or present something to the educators who attended. It's funny how nervous you are when you have to stand in front of others, not knowing how things will go. In the picture captioned "EdCamp Putnam", I am demonstrating how to use a few apps available on the iOS devices. My friend Kim Martin is to credit for this picture as she is an incredible supporter and works in Volusia County Schools. 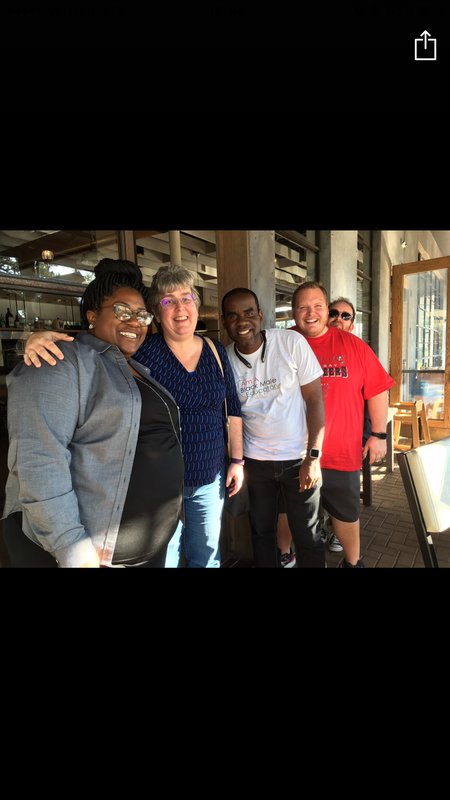 PasstheScopeEDU was founded by Valerie Lewis as a means for educators around the globe to share the learning and insights with other educators and students, removing the walls that often serve as barriers to learning. This was my first opportunity to get involved and I have to say, the idea of sharing with a global audience and learning from those in their respective areas, countries, cities or states, was engaging, not to mention unifying. I had the tremendous honor (again a first) to be asked to participate as a panelist in a Fresh Grade online webinar, to highlight my experiences in using it as a tool to bridge school and home, individualize learning for students, as well as increase communication between parents, students and the teacher. Alongside another panelist, we spoke of the ways in which we have embraced Fresh Grade, and the tips, tools and tricks by which we are able to accomplish tasks. This was the first time that I'd ever been asked. The presentation was a success and even during the process, I learned from Rob Heinrichs about his approach to the Fresh Grade platform. I will eagerly support something I believe in. I suppose the focus then is to make me a believer. I am a believer in the Fresh Grade application as a learning management system. It is easy to use and easy to guide others in its use. Another glorious testimony of the learning that happens with eager educators seek after knowledge. Where does it put us if we stop learning today and never pursue anything new. What message would that send to our students regarding our position as educators and the learning that we expect our students to do. EdCamp Tampa Bay is led by the wonderful Fran Siracusa and Jennifer Williams. 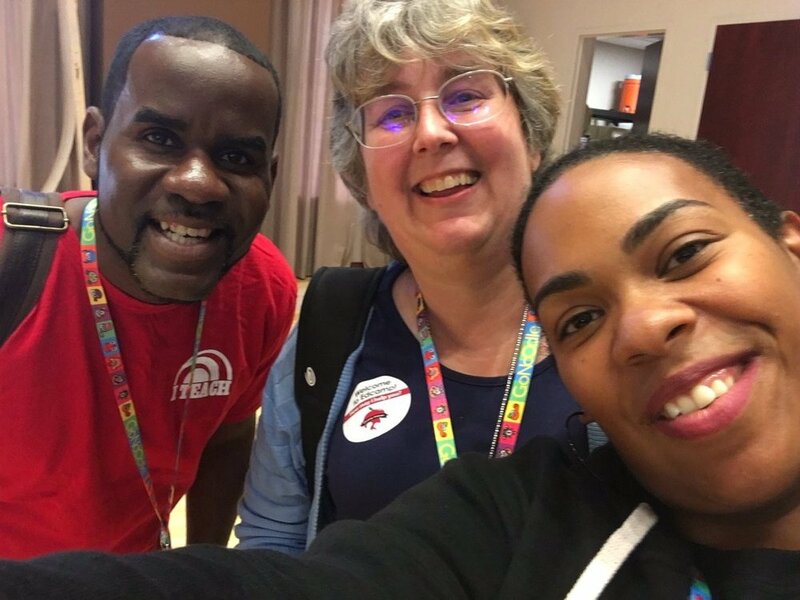 This is a candid photo of I along with friends at EdCamp Citrus over in Inverness, Florida. Another glorious experience learning about a variety of topics that aid in the development and longevity of our classrooms and student learning. It is always a fun time with this crew. This was another first this year. I kept thinking to myself: How can we encourage parents to be more involved in their child's educational process as well as meet a need had by parents? Because of our newest partnership with Full Sail Labs, out of Full Sail University, this was the perfect opportunity to as they say "kill two birds with one stone." Full Sail Labs has partnered with us to increase the momentum in engaging students in the computer sciences as well as the arts, as part of the effort and an extension of the offerings we already provide at school. So, the idea of a Technology/Social Media Boot Camp came to mind, with a two fold purpose: to educate parents on the social media platforms that exist today and the ramifications of use, as well as to provide them with the knowledge of devices, programs, tools and applications that their children use in school. This would enable them to better assist at home, and provide an overall meshing of the learning process. Google Forms allowed me to easily create an interest survey to be sent out to all parents at the school by our administrator. As responses came in, we learned exactly what parents were interested in learning and developed the boot camp around these ideas: chrome books, Periscope, Instagram, Snapchat, Fresh Grade and Twitter. These ranked highest among topics identified. The additional topics might be held for a future boot camp. We were able to have the boot camp on November 15th at the school and I was joined by two excellent educators from Full Sail Labs, to run the six 45-minute sessions, three happening concurrently. We had several parents attend and the follow up at the end of the night included expressions of gratitude for the knowledge gained and how each looked forward to additional technology boot camps. The two sessions I facilitated were Fresh Grade and Periscope. As a Fresh Grade ambassador, I have learned a lot about the platform as it relates to individualizing learning and representing student learning in a variety of ways, not to mention the window it creates for parents into the classroom. I was able to create a mock class and guide parents through the usefulness of the platform as a learning management system as well as show them the inner workings. The parents were engaged and asked several questions about the viability of the platform. I had iPad devices on hand for parents to use to access the app although one decided to download the app on her own mobile device. Session two on Periscope included a greater number of parents and they learned about the operation of the tool and its appropriateness for sharing ideas and learning with others when they are unable to attend. Not only were they all impressed by its potential, several downloaded the application in the very session and began playing around in the sandbox. We will send out a follow-up survey where parents who attended can document their learning. We will also send out information and tips to continue to develop their understanding. Finally, our goal is to have at least one more social media boot camp prior to the end of the school year. By such time, the word will really be out and we had several that were unable to attend the first event. It was a tremendous success to be enjoyed by all. I am grateful to my principal @charternation for having allowed me to go forward with it as well as the Full Sail Labs facilitators/educators for the awesome job they did presenting information. EdCamp NABSE was the first Ed Camp that I've ever helped to organize. The picture below does not show everyone, but I will mention all who were part of the organizing team: Knikole Taylor (Leader), Kim Lane, Tammy Neil, Fran Siracusa and myself. It was great day out at the Tampa Convention Center and conversations were had by all. I am grateful for having had the opportunity to take part in another of our 49 Acts of Kindness, caroling with a few of my students at the Beardall Senior Center in downtown Orlando. What a great experience it was to participate with them and showcase all of the talent that our school has, not to mention serve the senior citizens that interact within the building. Smiles decorated their faces as they watched the kids perform. We sang a total of six songs and all parties involved were overjoyed by the experience. There is a link to the YouTube video, if you care to watch and listen; The link is here. Something great will be announced around this time that I was grateful to have taken part in. Stay tuned! This certainly does not totally capture the year, but this post contains many highlights to all of the events that took place that have shaped me. I am grateful for all that has transpired and I am looking forward to the greater in 2017. Thanks for reading this post and I welcome any comments you may have. Mischief managed! I have amended this post and added this. Tammy and Justin have been a great encouragement and "pushers," you know the ones who see the good in you and push it out. Please make sure you follow Justin Schleider and Tammy Neil (founder of FLedChat) on Twitter. These are phenomenal people. Justin blogs here and Tammy's writing can be found here. What are the actions of an educator that are connected to perception? How does perception lead to action? What are the actions of an educator that is driven by a passion that is bigger than the issues and challenges faced? I have ten years of classroom teaching experience and one thing I have come to know is that sometimes my plan does not align with what needs to happen at a given moment. If the goal is to foster a student-centered environment, where the student is the complete focus, and I mean the whole student, then the decisions made about what happened in the classroom should reflect this activity. You have heard the phrase many times I am sure, that actions speak louder than words. Indeed it is still true. We think therefore we act. We are beings of action as educators. We are shaping the next generation; we are the catalysts by which students become leaders. Without the cultivation, leadership, inspiration, motivation, building and enriching of students, then we cannot see them "CLIMBE." "The future depends on what you do today." ~ Mahatma Gandhi. The Will A well-known proverb states "where there's a will, there's a way." In other words, if there is a desire to do something, there is a way in which to get it done. One of the greatest facets of an individual is the will, or the option to choose what one will do or how one will perceive and act. When you are challenged by administration because you have a totally different perspective or perception of what students need in the classroom, what choice do you make? Do you decide on what YOU as the skilled educator knows is best for the current-year students, or do you act based on administrator pushback? Or, do you attempt to demonstrate the effectiveness of your instructional practices and allow it to speak for you? When you have parents that do not agree with your teaching style, do you continue to go down the path that you are driven or do you side with parents and provide alternatives in order to satisfy them? When you have fellow educators that are unwilling to grow and change, but would rather stay stuck in yesterday, do you allow yourself to adopt a similar lackadaisical attitude, or do you realize the growing need for innovation and change and act on it? These can often be tough decisions for educators. It is the will of an individual that embraces the opportunity to be driven. Above all, and considering all of these possibilities, perhaps you are the spark that it will take to start the engine. Perhaps you are the one who will drive the car. Perhaps by stepping out into unfamiliar territory, having the courage to take the step, may cause others around you to start to question what you are doing, how you are doing it and how they may jump on board and do it with you, becoming driven themselves. The Resolve When the day ends, will the educator be pleased with the strides he or she has made to prepare students to achieve greatness? The student-centered classroom is based on constructivism of knowledge and student empowerment in order to maximize learning experiences. In a student-centered approach to learning, the teacher intentionally acts as facilitator, offering feedback, guidance and challenge to students. The end result is that students own their learning and become empowered to actively engage, construct, define, extend and challenge themselves and others. These are simply a few of the active verbs associated with student learning. When students are the ultimate and driving focus, they tend to determine what is taken away from an experience, or what experiences are necessary even. In this way, educators, like you and I can move away from typical ways of teaching, learning and assessment, to more authentic and meaningful forms. Steven Redhead said "The world you acquire and partake in is purely driven by the choices taken." A future post will follow this one and will be titled "The Case for Empowerment." 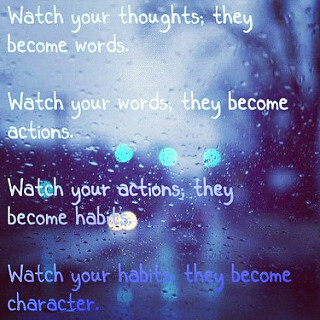 "Plant a thought and reap a word; plant a word and reap an action; plant an action and reap a habit; plant a habit and reap a character; plant a character and reap a destiny." Here is my point in all of this: I believe that as educators we are the change-drivers and in order to turn that into action, we must first believe that we have what it takes to make change happen. Can change happen when we are unwilling to change? Will our students experience a change when we continue to do things the way that they have always been done? If we continue to think like we have always thought, will action and change erupt? I believe that it through experiences, learning and reflection that we are challenged to think and therefore act differently. We create the existence we live in by the way we think. I'll end this with a quite by Steve Jobs, "Here’s to the crazy ones — the misfits, the rebels, the troublemakers, the round pegs in the square holes. The ones who see things differently — they’re not fond of rules. You can quote them, disagree with them, glorify or vilify them, but the only thing you can’t do is ignore them because they change things. They push the human race forward, and while some may see them as the crazy ones, we see genius, because the ones who are crazy enough to think that they can change the world, are the ones who do." It all starts with a thought. The Whole Student...the Whole Teacher. We look at our students as a whole student. When was the last time we viewed ourselves as a whole educator? You might be wondering why I have titled this post as such. I have to say that I feel that life is a collection of experiences. I believe that the experiences that make up life, both good and bad, are necessary to mold, shape, develop and stabilize us, in a life that continues to change. I have hard many people speak to the idea that the only consistent thing in life is change. Tragedy is never a welcomed event, but one thing is certain, it is in the challenges of life that we become better, stronger, better equipped and more vigilant. As educators I believe that we have a great task on our hands. Being a doctoral student, one thing I have become very familiar with is turning the page, due to the great amount of reading that is necessary to learn and grow. We might then compare life to a book. We might say that the pages of the book reflect days in our lives, or perhaps the experiences that shape us continually to not become complacent, or satisfied. Sometimes it is a difficult thing to turn the page. It takes strength. It takes courage. It takes forward thinking. It takes a certain drive to persist amidst the vicissitude of recent days. Our hearts hurt, yes, because we are human beings, full of emotion, trying to piece things together to see the complete picture. Does it all make sense to me? Certainly I do not have all of the answers, but one thing I do know; it is important that we turn the page. Let's not stay here. One of the lessons I use in the classroom on a daily basis challenges my students to be better. Though there is nothing wrong with being average, I challenge their mindsets to not settle for average or status quo. I ask "What stands out about you?" or "What will people notice when they look at you?" It's easy to blend in with the crowd, but why not take that extra step and be authentic? For a student, that might mean instead of asking me certain questions, he or she seeks after that knowledge using available resources. I think the same applies for me as the educator. Once I stop learning, then I am limited in the knowledge I am able to pass on to my students. So as an educator, I am always reading or involving myself in some sort of development, to continue to be better. Genuine to means that I really care when I say that I do. Or perhaps, I demonstrate what I say with my mouth. I know we have all experienced a let down or two in life, perhaps even more than that, however, imagine how you would felt if you knew, by word and deed, that the person acting on your behalf, was genuine. Would you invest more, trust more, engage more, when you know that the individual truly cares about you? Educators just might be the bridge that takes a student from one side of the water to the other. An educator might be the reason that a student decides to care more about what and how they do. An educator might be the reason why gaps are filled and support is felt by not only students, but families. I am all about setting a positive example.An example is a visual representation of the possibilities. As a visual model, we provide the hope that students can learn and grow and develop to do whatever they are interested in. There is no limit to the learning that can occur, when we are the example. Does that mean that every educator needs to hold advanced degrees? In my opinion, not necessarily, however it does mean that teachers can demonstrate what it means to seize opportunities and show kids that things can be attained. I am grateful for the creative and artistic talents that I have as well as my time as a uniformed service member of the US Air Force. These strong skills come into the classroom with me every day. In addition, the idea that I am a doctoral student provides an example to students that you can do anything and the greatest limits are ourselves. What is light? Light is the absence of darkness. Light and darkness cannot exist in the same place, in its natural sense. Darkness may be described as any place where there is no hope, concern, care or love. It may just mean that someone needs another to care. As educators, I believe that we are the catalysts for change. I believe that we can bring light into dark places. Considering recent events and things that happen in all of our lives, what a immense opportunity lies before us. We can be the reason that our students pursue the proper path with persistence. We can be the reason why students keep trying when things may not always go as planned. We, the educators can be light to paths that are dimly lit or dark. We potentially can be the reason why someone turns the page.